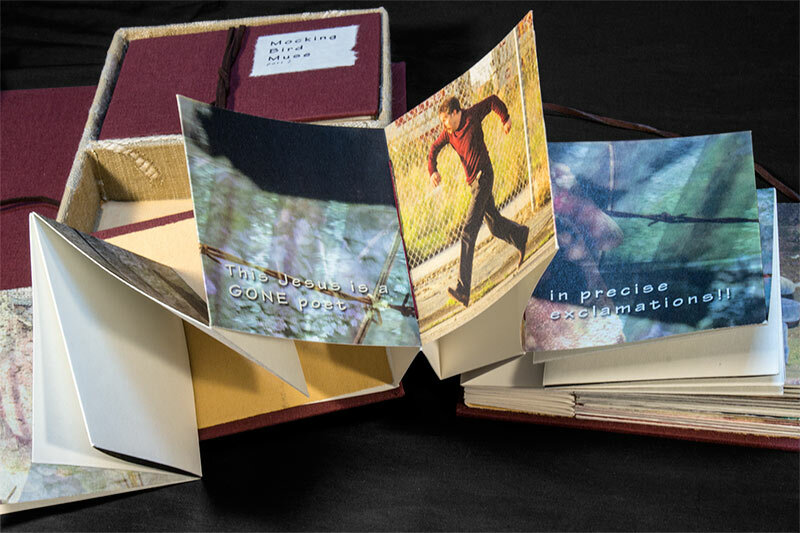 You can click on the small images to see larger versions. Mom’s Memorial Prius now bears the dimples bestowed by “quarter-size hail” from a sudden thunderstorm that enveloped our climb into the Sierras during the last homeward trek. Luckily nobody skidded off the road, and no glass was broken. Scary though, when the windshield goes opaque with rain and hail. Oola couldn’t see that part; she had her hands over her eyes for fear of the trucks. It has been several weeks since the trip to Tennessee, several very busy weeks. 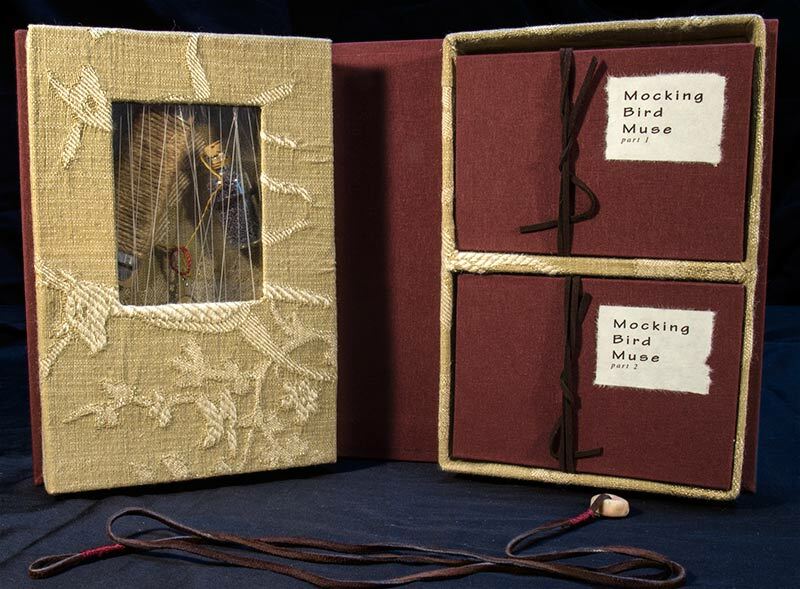 Among the results of all that activity is my newest artist book, Mocking Bird Muse. Sometimes it takes a long time for a poem to ripen. 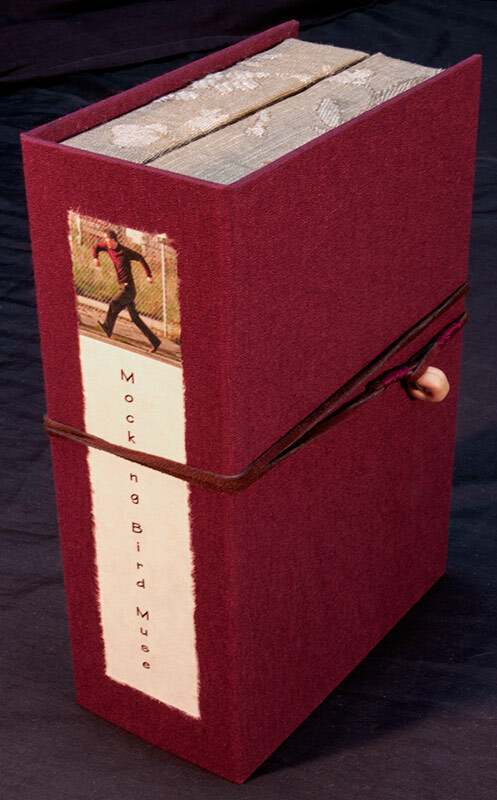 Mocking Bird Muse started as a poem about a prisoner/poet I knew when I worked as an artist at California Medical Facility in Vacaville in the ’80s. 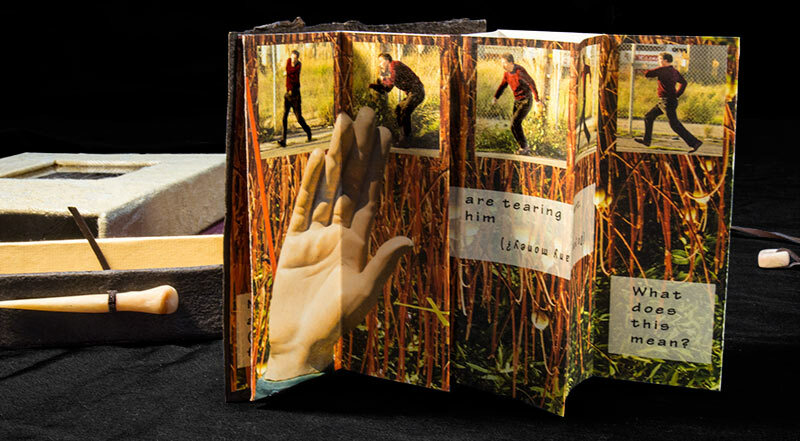 It grew into 2 books (each consisting of 4 one-paper books containing one line of the poem with photo collage) and a small one-paper book. And it is no longer about a specific prisoner, or even about any prisoner in the conventional sense. who combs his hair in precise exclamations!! This poet has been known to steal crazy time. He flies a mocking bird muse. He drives a yellow bus. I wanted to tell my father. His own hands are tearing him apart. They say that somewhere along the way he lost his soul. 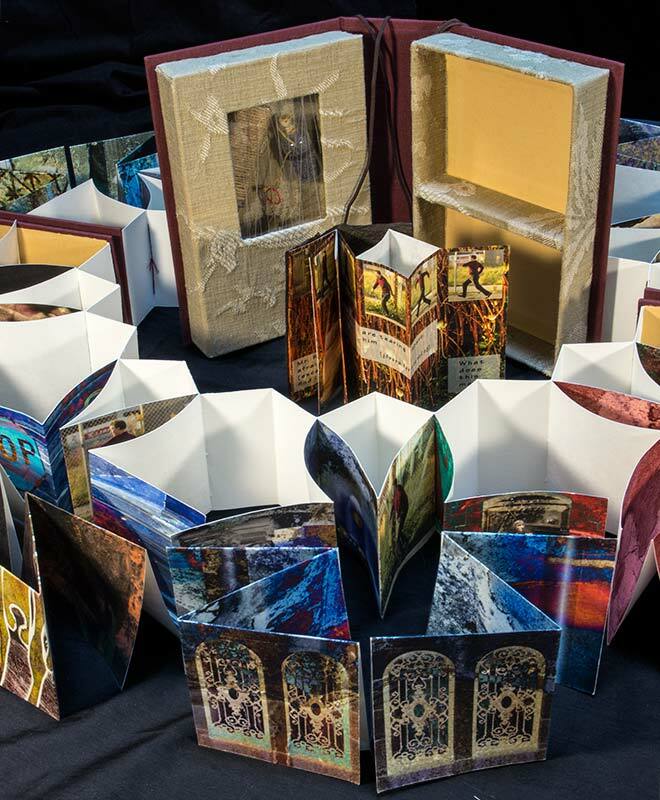 The construction of this book reveals a delicious geometry which I only dimly planned, but which gives me much pleasure. 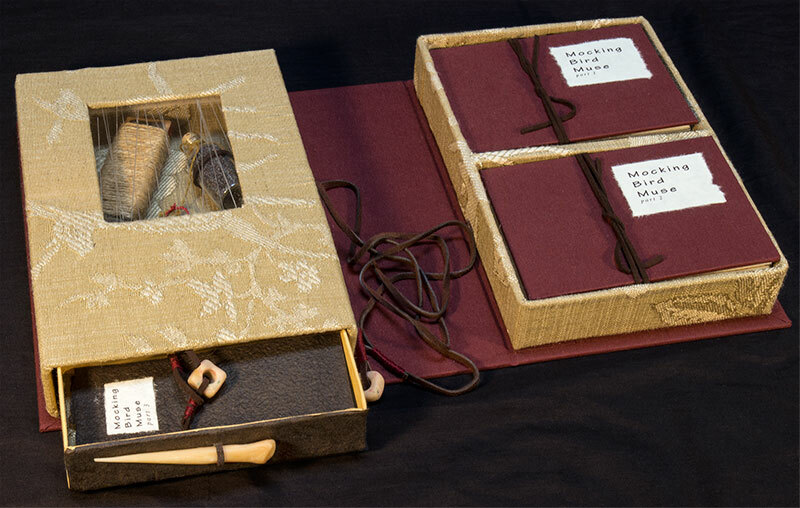 In case you are wondering, the amulet behind the window consists of a jute-wrapped harmonica, a bottle of poppy seeds, a frying pan, and a red unexplained object which just looked right. 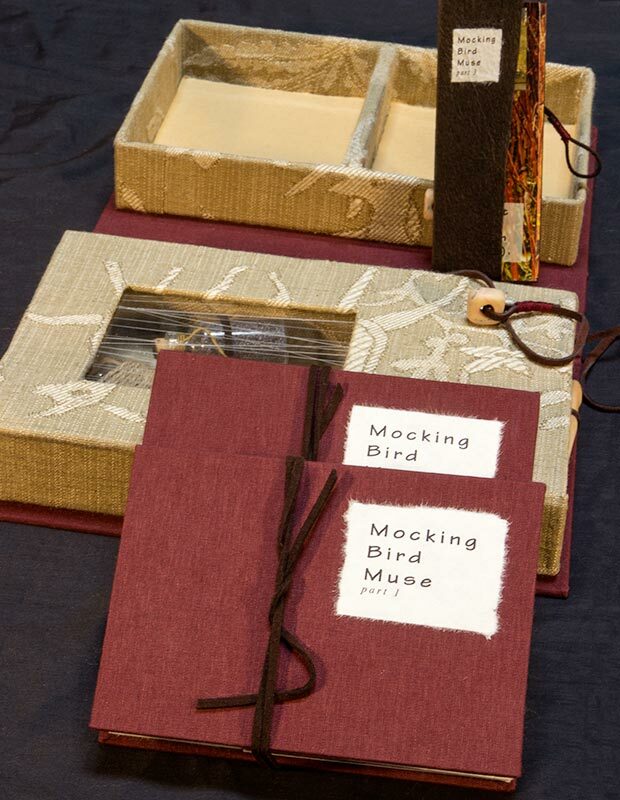 Mocking Bird Muse is digitally (and archivally) printed on Asuka and hand bound. Technically this book cannot be editioned because the amulet behind the little window is not repeatable, But I would be happy to entertain proposals for an EV. Next Next post: What the Hay-L is That?